Pampanga: Fr. 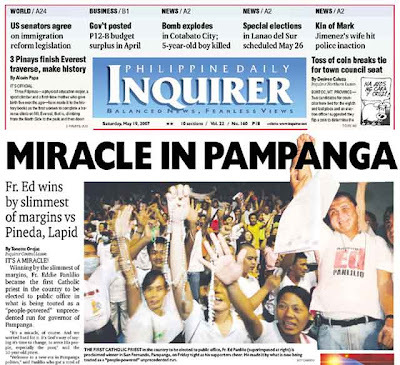 Ed Panlilio is Pampanga governor-elect! Among Ed won the elections! Go Pampanga! I just came from the proclamation of governor-elect Fr. Ed Panlilio. Indeed, every vote counted. He won by 1,147 votes! I'm sure that should have been bigger (if you know what I mean). But the important thing is he won. May Pampanga lead the way for the Philippines! The atmosphere at the Bren Z. Guiao Convention Center was electric. The crowd was phenomenal! It was not the type that lined up for something after (not hakot in other words). It was people power! More photos in Multiply. Congratulations to Mayor Fred Lim for winning the mayoral elections in the City of Manila! The city's heritage now has a protector. Also check out a video of Iloilo heritage produced by the Iloilo City Cultural Heritage Conservation Council, the City Government of Iloilo, Canurb and ABS-CBN, uploaded by Bernard Arellano. Bravo Iloilo City! wow! finally!!! 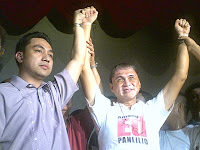 angeles city never got to vote for governor, but the city is very much involved in the campaign of among ed. nung akit mu la ring posters ampong banners na keni, isipan mu magboto lang governor ing angeles. finally!!! mikapag-asa ne rin ing pampanga! me too!!! Im from angeles...we never vote for governor but i had always wanted him to win. We need change...dinatang ne ing pag-asa tamu. Go Pampanga!!! OHMYGOD!!! I AM SOOOOO HAPPY!!! His triumph could be the break we have all been waiting for. His administration is worth watching by other good men and politicians who only have the people and nation as their priority. His resolve and faith should not waver despite obstacles that he will face during his term. after a long long time, i feel really really proud to be capampangan again!!! we all went nuts cheering!!! i'm kapampangan-born. mabuti nanalo sya! yaay! kasi naman e, corrupt ung dalawa (not to mention the ely pamatong guy). nice! for once may ginawang masanting mga tao sa atin pagdating sa eleksyon..
omg... that's great! akala ko c pineda nanalo..
@spanx, Friday evening? Did you know it was still a cliffhanger Friday evening? Di pa alam kung sino talaga nanalo. My brod was the lawyer in Porac. He told me all the stories of the cheating attempts. Buti vigilant siya! Porac was among the important towns. Although Among finished third, they were able to thwart attempts to change the numbers there. our whole clan from san fernando was in wack wack for the reception... and we all started getting text after text after text at around 6pm from everyone including Babes Lazatin and our Pampanga's Best Hizon relatives, so we figured, they wouldn't lie. hahahah! The EDquarters only knew for sure close to 11 p.m. when the final numbers from Porac came in. MABUHAY KA PAMPANGA! MABUHAY ANG MGA KAPAMPANGAN! Too bad my precinct was in Angeles City where you couldn't vote for a governor. Nonetheless, I voted for Among Ed in spirit. yahoo! victory for all of us! i'm proud to be kapampangan because of Among Ed! Its over now I think....Who wins ??? kinilabutan ako sa mga news at posts niyo. i'm not from pampanga...but i love pampanga food. sisig nga ulam ko kanina eh. hehe. i'm happy for you guys. i hope this ushers in a new generation of leaders and martyrs not only in pampanga but for the whole country. the voting public is maturing. look at how my idol manny pacquiao and the rest of the movie stars and trapos were trashed big time by deserving public servants. it's something to be hopeful about. mabuhay tayong lahat! A 3-way fight to the finish with Anak ng Diyos prevailing over Anak ng Jueteng and Anak ng Vulcan! I'm so proud of being Kapampangan right now! Next up is making sure that his administrative staff won't be infiltrated by people with selfish interests. ...i could only hope the death threats remain just as threats though... money, influence and defeat doesn't seem to bring out the best in most people... we capampangans should be vigilant for the safety of our among gov... mabuhay among!!! Although I'm not a registered voter, I'm as proud as any other Kapampangan who supported Fr. Ed. However, we have to keep in mind, there's 2/3 of the voters who DID NOT support him during the election. Panalangin tamung mibuklud-buklud la reng egana-ganang Kapampangan para suportan ya ing kekatamung bayung Gobernador. Thank God something good came out of this elections. Congratulations to all Capampangans. i have been to his vigils,rally`s and to his proclamation day..its been a unforgetable expirience for me,..and im proud for being a KAPAMPANGAN!! mabuhay AMONG GOV.!!!! I saw this post earlier today but it just goes to show how jubilant the people of Pampanga are over Fr. Ed's win. Sai BPO Services (UK) Ltd.